My father told me once that his favorite treat as a child was a sandwich made of white bread, sweetened condensed milk, and a Hershey bar, left to warm outside in the hot Louisiana sun. I can just picture my dad, the little boy known by all as “T-Roy”, (Cajun for “petite Roy” or perhaps, as his mother and older sister would have felt, “little king”), biting into it, with the softened chocolate oozing into the warm and creamy condensed milk, and the gooey mixture squirting out of the sides of this dessert sandwich. This, no doubt, would have been washed down with a glass of milk, fresh from the cow. 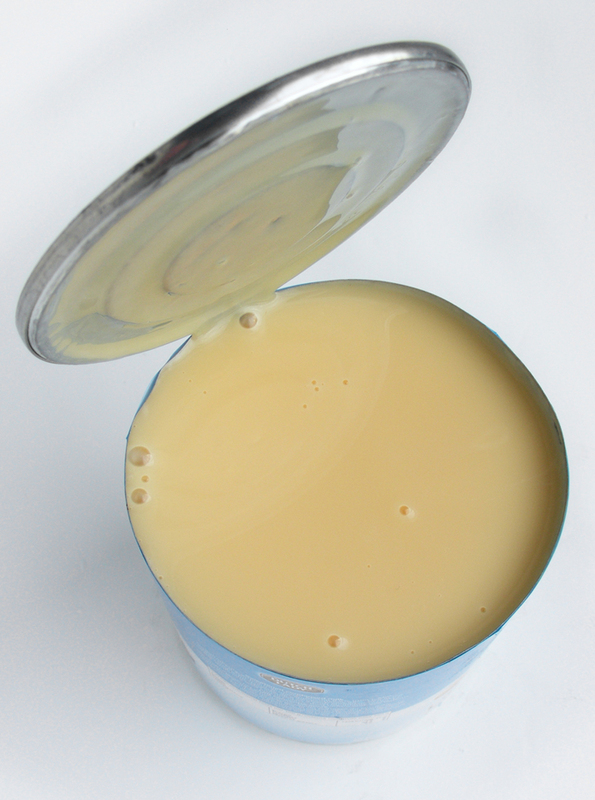 I grew up seeing a can of sweetened condensed milk sitting, opened with its metal lid hinged upward, on the counter next to my Aunt Helen’s coffee pot. She liked a spoon of it in her coffee, instead of sugar and regular milk, to create the perfect café au lait. I also have strong memories of seeing my cousin Penny eating the condensed milk out of the can with a spoon. We didn’t use it at home; my parents drank their coffee black with sugar, until much later in life when my dad started adding a bit of milk from the fridge to his coffee. And, since my mother was not much of a baker, we didn’t regularly have it around for making desserts. Fresh milk, however, was a staple of my childhood home and of mine today. My brothers consumed vast quantities of milk along with entire boxes of cereal as an afterschool snack. My mom kept us well-stocked with milk, even though she didn’t drink it at all herself. My dad preferred a glass of milk with his lunchtime “half a sandwich”, only occasionally having “half a Coke” instead. For supper, the evening meal, I don’t remember him having anything to drink, until much later in life, when he started drinking red wine. He often had a glass of milk before bed, something I continue to do to this day. I am often asked by friends, who all know I love to cook and bake, what is the difference between sweetened condensed milk and evaporated milk. The answer is simple: sugar. 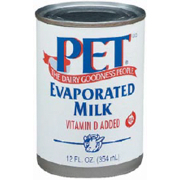 Evaporated milk is just milk that has had half of its water content removed. Evaporated milk can be substituted in recipes for regular milk by adding water or straight out of the can for a richer, creamier result. For the most delicious mashed potatoes, try using evaporated milk. Just peel, cube, and boil the potatoes until fork tender. Drain them and allow them to “dry” a bit before adding them back to the still hot pan they were cooked in. Mash and season with salt and pepper, adding evaporated milk straight from the can until the glorious off-white mountain is the consistency you prefer. Then, add softened or melted butter, taste, and adjust seasonings if necessary, and serve to the sounds of oohs and aahs from your loved ones. My family loves pancakes, waffles, and biscuits made from Bisquick, and years ago, when one of my daughters asked for Bisquick biscuits, I used evaporated milk because we were running low on fresh milk. The biscuits were even more tasty than usual, and since then I’ve always used evaporated milk for the Bisquick recipes. 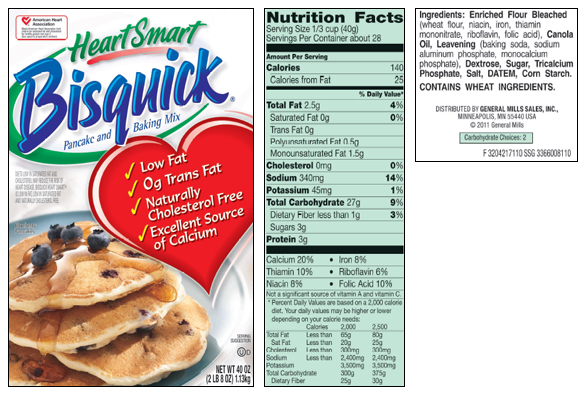 Nowadays I use the Heart Smart Bisquick and fat-free evaporated milk to prepare the recipes straight from the side of the Bisquick box. Of course, fat-free does not matter much on a low-carb health plan, so Bisquick doesn’t feature regularly in our meal planning much anymore. 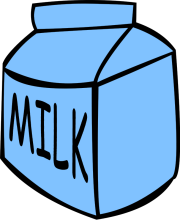 Sweetened condensed milk is also fresh milk that has also been evaporated by half, with the missing liquid being replaced by sugar. 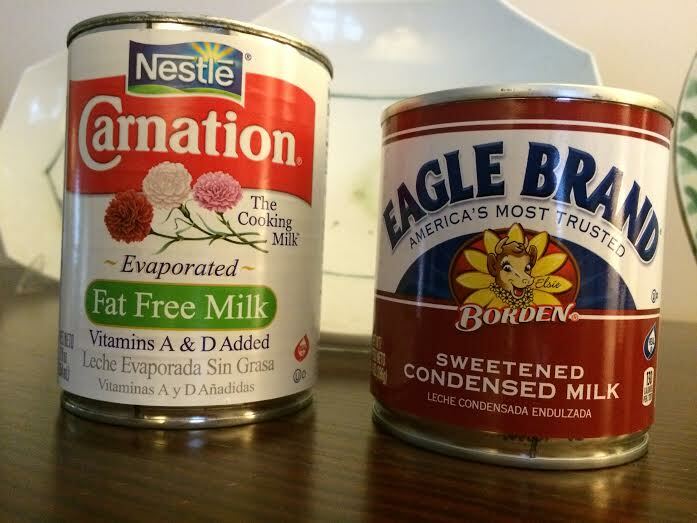 These two products, evaporated milk and sweetened condensed milk, cannot be used interchangeably, but they both have their place in my pantry of staples. This is something I had to sort out myself years ago when I found a long-lost family recipe for fudge. The recipe, handwritten on a piece of paper torn from a stenographer’s pad, calls for “one large can cream”. 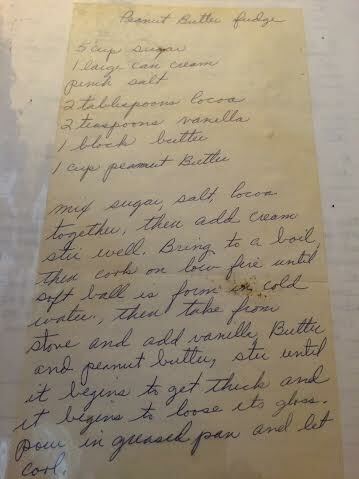 When I first found the recipe in 2002, buried in a box of newspaper clippings, junk mail, and ephemera from my daughters’ elementary school, I knew right away I had found the missing treasure, the secret to my Aunt Lillian and my cousin Joy’s famous peanut butter fudge, but I was stymied by the term “can of cream”. I remember calling home, from Belgium to Louisiana, to ask my mom and dad what was a can of cream. My dad’s first answer was, “A can of Pet milk.” Next question: “What is Pet milk?” Finally, we established it was simply a can of evaporated milk, and off to the kitchen I went to recreate the dense, creamy perfection known as Aunt Lillian’s Peanut Butter Fudge. All of my daughters’ teachers that Christmas received a box of the fudge, and even those spoiled by growing up with Belgian chocolate and French pastries, swooned at the first taste. 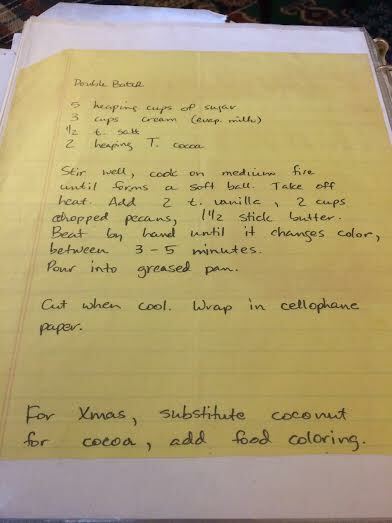 I have another recipe, in my own handwriting, which calls for “3 cups cream” and in parentheses I have written “evap. milk” to clarify. This recipe I believe came from my friend Donna West, whose father was the local dentist. He made the best chocolate fudge and I think this is his recipe. I can remember eating it out of a glass Pyrex dish standing at the counter in her kitchen. I also have been the recipient of handwritten recipes calling for evaporated milk’s first cousin, sweetened condensed milk. 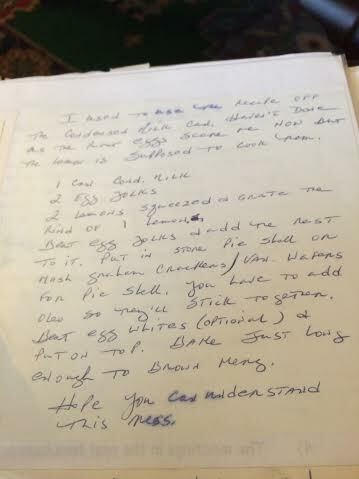 My mom sent me a recipe for “ice-box lemon pie”, advising me that she used to make it “years ago” but stopped because the raw eggs scared her after her kidney disease and subsequent kidney transplant. This recipe doesn’t scare me, especially with the availability of pasteurized eggs, and it is very simple to make, but the filling has somewhat of a “tinny” taste to me, no doubt caused by the sweetened condensed milk not having any actual cooking time to mellow out the canned taste. 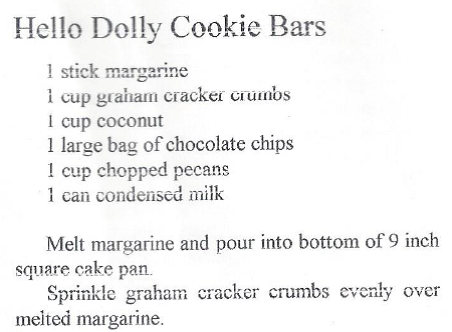 Another one of my cousin Penny’s sweet concoctions is the Hello Dolly cookie bar. This is no ordinary cookie, and could be used to test the levels of blood sugar after fasting, instead of the nasty glucose drink forced upon me when I was pregnant. It’s a simple layered cookie bar recipe: graham cracke r crust, layer of chocolate chips, layer of chopped pecans, layer of coconut, and then topped off with a can of sweetened condensed milk drizzled over the top. After baking, it is necessary to let it cool before tasting, or risk burning the roof of your mouth from the caramelized sugary liquid glue holding the layers together. When you have tired of drizzling it over cookie bars or into your coffee, there are many other uses for sweetened condensed milk. Perhaps the most popular use for it outside of the United States is dulce de leche. This is sweetened condensed milk that has been slowly cooked until it caramelizes and browns, turning it into a thick, toffee-flavored spreadable substance that finds itself in between layers of butter cookies, known as alfajores, or used as the filling in a jelly roll sponge cake known as pionono. My husband LOVES dulce de leche, and while living in Belgium, I became friends, via French classes, with a woman from Argentina and a woman from Nicaragua. One day I innocently asked how to make dulce de leche and started something of a cultural war as they both excitedly tried to tell me how it was made in their family homes. It is a bit scary, placing unopened cans of sweetened condensed milk in a large stock pot filled with water, bringing it to a boil, and then reducing the heat to a simmer for three hours. The water must always be kept well above the tops of the cans or you will have sweetened condensed milk dripping from the ceiling of your kitchen after the cans explode. This can now be purchased ready-made, in a can that looks a lot like the sweetened condensed milk cans on your grocer’s shelves, but there is something satisfying about opening that can, after it has completely cooled, and unearthing that sweet, sticky goodness of dulce de leche that you created yourself. In the rear of the Argentinian restaurant near our house tubs of dulce de leche can be purchased, as well as the jelly roll sponge cake, ready to be slathered with the toffee filling and rolled up. All it needs at that point is a dusting of powdered sugar and you have a delicious and exotic treat, albeit “assembled” rather than “homemade”. Another shortcut dessert that takes just a bit more effort is a home cook’s version of the alfajores. The butter cookies are made using a box of yellow cake mix, and then spread with the dulce de leche, whether store-bought or simmered to perfection on your own stove. Cake box sandwich cookies are very easy to make: one box of cake mix (any flavor), two eggs, and one-half cup of vegetable oil. Mix together well, and then portion out onto parchment-lined baking sheets using a mini-ice cream scoop. Bake for 6-8 minutes or until lightly cracked on top and lightly browned on bottom. Allow to cool and then make a sandwich cookie with two of them and a filling of your choice: dulce de leche or a tub of frosting. My friends and family members adore these, and I’ve tried many variations: German chocolate cake mix with coconut pecan frosting, red velvet cake mix with cream cheese frosting, or lemon cake mix with dark chocolate fudge frosting. A few years ago I became friends with a middle-grade children’s book author, Cindy Callaghan. At the time she had one published book, Just Add Magic, which was a fun read about a magic cookbook. I started a book club at my school, and after we read the book, we made some of the recipes in the back of the book and had a Skype visit with Callahan. We exchanged emails where I gave her feedback on the recipes and volunteered my cooking skills in the event she was in need of future themed-recipes. She gave me the wonderful opportunity to develop some easy to prepare treats for her next book, Lost in London, and featured my article on the British tradition of afternoon tea on her blog, along with my recipes. One of those recipes was for Banoffee Pie, a layered dessert consisting of a graham cracker crust, a layer of dulce de leche, sliced bananas, and whipped cream. I absolutely love food, whether it is eating it, cooking it, shopping for it, or reading about it. During this journey of “an essay a week for one year”, I’ve discovered that I love writing about it as well. I love exploring the history of various foods and ingredients, finding their origin and connecting it back to my childhood memories. Many of our earliest memories revolve around food, and digging around a bit to find out the background on some of those memories is very rewarding. Whether it is a handwritten recipe thought to be long-lost, or a favorite cookbook, grease-stained and dog-eared, these things are all a part of me, even as I say goodbye to those I love who created these food memories for me.